Newcastle United and manager Rafa Benitez continue the search for the 2018-19 season’s first victory, travelling to play Manchester United this coming Saturday. The Magpies have displayed poor form over the past few weeks, and the current situation causes all focus to be away from the pitch during each matchday. With many of the same players from their 2016-17 Championship squad still in the team, Benitez has been able to add good pieces such as Martin Dúbravka and Federico Fernández recently. Talent is certainly present, with Jamaal Lascelles and Jonjo Shelvey excellent examples. But, there is still a significant gap in quality when up against many of the other Premier League sides. It has created a situation where tactics must be conservative at best, not necessarily making for thrilling viewing. After promises of Benitez seeing “every penny that the club generates” from club owner Mike Ashley, this past summer brought the same type of disappointing transfer windows that the Toon Army have been accustomed to. Even with Premier League television revenue and money from the sale of Aleksandar Mitrovic to Fulham, key reinforcements did not arrive. Newcastle’s manager was able to guide them to a tenth-place finish last term, a feat being made to look even more amazing considering their current struggles. Benitez knows what it will take to survive, evidenced by their current position in the table. Despite zero wins and only four goals, United are still above two others after seven rounds of fixtures (Cardiff City and Huddersfield Town). The Spanish tactician knows how to manage risk, on display last season versus the likes of Manchester City. Sometimes, goal difference is an important aspect to consider. 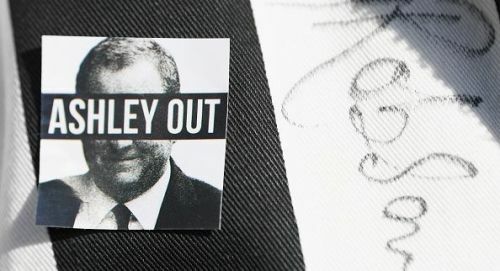 The cries against Ashley continue to grow, thanks to the efforts of “If Rafa Goes We Go” and The Magpie Group. Kevin Keegan’s new book has cast a bright light on the club’s hierarchy, and much of the mainstream media has been involved in the discussion. Benitez’s contract runs out at the end of this season, and nobody seems to have a hint of what to expect (especially if the Toon are relegated). St. James’ Park has seen anxious and tense moments throughout the campaign’s opening weeks, and Ashley’s presence at the grounds has only amplified that feeling. It all adds up to an indifferent attitude for many, as expectations and results continue to sink. For a club that had Alan Shearer, Les Ferdinand and Faustino Asprilla leading them into Europe and towards the top of English football, this is a scenario that would have been unthinkable only two decades ago. There have been rumours of a new potential buyer, but those talks have all been heard before. This time last year, Amanda Staveley was set to be Tyneside’s new saviour, and Ashley is not any closer to selling now than he has been in the past. He is viewed as a villain, and has created a separation between many fans and their beloved club. Newcastle United are more than just a football club, and represent the fabric and people of a wonderful city. Changes need to take place at the top, as the dire atmosphere can make one almost dread matchdays due to the poor results that could be on the horizon. That thought alone should be a cause for major concern.